Street photography motifs are a lot of different things; people, architecture, urban life etc. On a general level, I like when people interact with the urban environment and something humorous, odd or intense is captured. When I see street photographers work, I always envy that they are able to capture the moment. It seems so effortless, intuitive and perceptive how they are able to single out these incredible snap shots of human interaction. I say this because if you ever tried to work within the street photography genre, I think you will recognize how difficult it is, on so many levels to capture a fleeting moment in the pulsating street environment. It is so tough to balance lighting, storytelling, emotions, composition, human interaction and expression, communication etc. in the split second you happen to notice something that might be a precious moment. What do I once in a while do? Two approaches that works for me when trying to capture some street life is what I call “The waiting game” or “Spotting the fabulous”. In short “The waiting game” is my term for hangin’ around a certain urban space that has some interesting spaces, lightning or backdrops waiting for something to happen. “Spotting the fabulous” is my term of suddenly noticing a special person that has something out of the ordinary. I then keep my eye on this person, following him/her for a short while snapping photos. Sounds like stalking – kind of is, but I think and hope it is harmless what I do. I have never been confronted or had unpleasant experience or looks. So a couple of weeks ago I was going to what is called Swoop Challenge in the centre of Copenhagen. I came early and spotted a small boy with an umbrella and thought that could be interesting so I effectively went into “The waiting game” after “Spotting the fabulous”. I hung around shot roughly 17-20 pictures of the boy. Below is a small contact sheet of the 10-15 minutes it took. I also took pictures of the umbrella in the boys mothers hands – but that is a different story. So what I wanted to say is, getting a good shot takes time and…yes… a lot of shots. (At least for someone like me….). 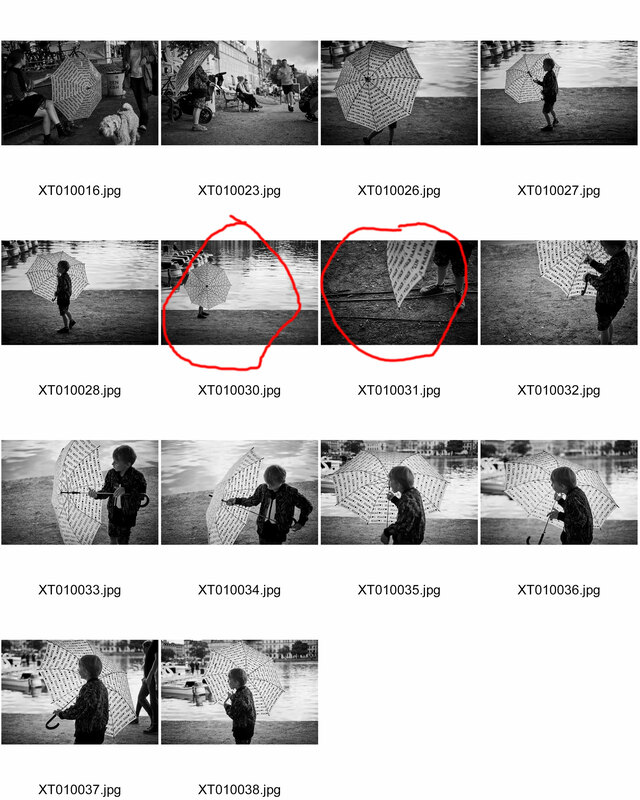 There are a couple of shots that are nice, and I ended up liking the shot best, where the boy hides behind the umbrella only revealing his feet – which is also the photo at the top of this blog post. I admit I do not get a nice shot every time or day for that matter, and I guess that is why I am so happy when it actually happens. Share your thoughts, and tell me what kind of methods do you use when you shoot in the streets?